Cotton or Silk Embroidery Threads for Silk Shading? Should I use cotton or silk for silk shading? Is cotton a better choice for silk shading? Since lately I’ve received a few questions about whether or not silk shading (needle painting, long and short stitch shading, soft shading…) should be worked in silk or in cotton, I figure there must be more people out there with the same query. So today I thought I’d address the question, following up on last week’s article on my case for using silk in hand embroidery. I think there’s more to this than just an “either / or” answer. So let’s chat about it! 1. What level of stitching are we talking about? Are you a beginner? Have you ever done needle painting before? 2. What is your preference when it comes to fibers? Have you tried working with silk? Do you like working with cotton? Do you dislike working with either? After all, we’re talking about your embroidery pursuits. Your needlework. Which is supposed to be a pleasurable undertaking for you! That said, if you’re suffering under the impression that only cotton should be used for silk shading, or that cotton is more suitable for silk shading, or cotton performs better than silk for silk shading – which seems to be the crux of the matter, according to the questions I’ve received – then I’d like to offer some further musings for your consideration. Taking things back a bit, silk shading is called silk shading for a reason. It’s been done – and done well! – with silk for centuries. To insist that cotton performs better than silk for silk shading is a rather limited approach. Cotton certainly performs for silk shading, but does it perform better? Is silk somehow inferior for silk shading? The fact is, silk shades beautifully. The rose in the photos above demonstrate this pretty well, I think. 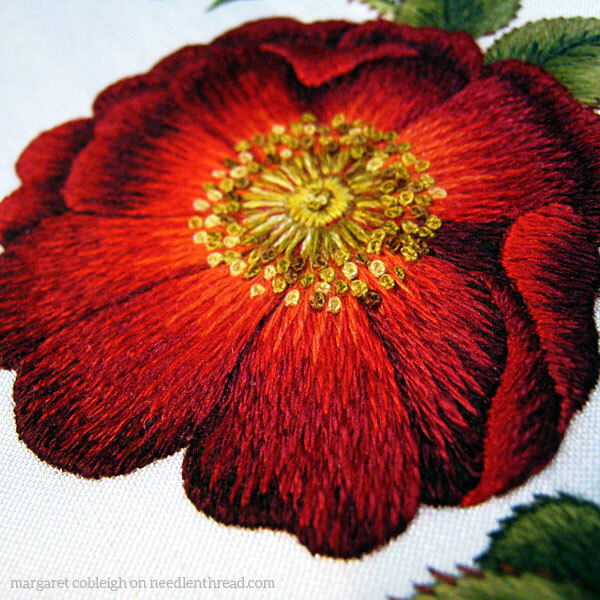 This particular rose – it’s the French Rose from Trish Burr’s beautiful book, Colour Confidence in Embroidery which I reviewed here – was embroidered by Margaret Cobleigh, who blogs about her embroidery at Sharp Needler. 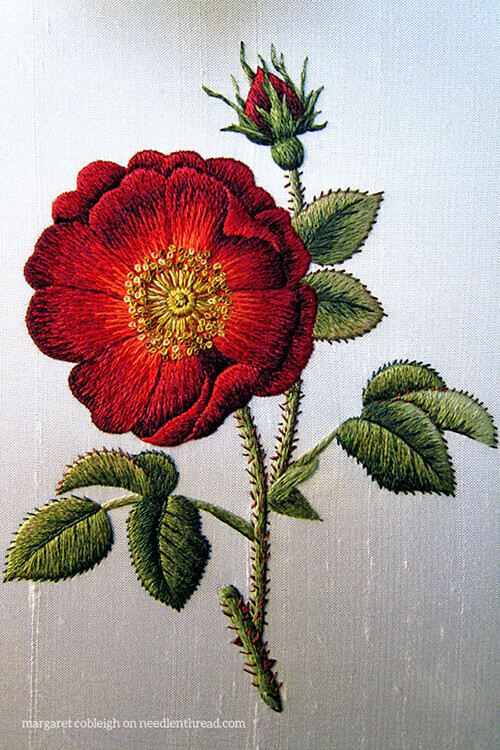 The rose is embroidered in stranded spun silk (Soie d’Alger) and the leaves are embroidered in cotton. I’d be hard pressed to say that the silk used in the piece above didn’t work, or didn’t work well, or didn’t work as well as cotton could have. The piece is stunning – over-the-top beautiful, a fact that has to do not only with Margaret’s mastery of the technique, but also with the materials she used. Silk, and especially spun stranded silk (like Soie d’Alger), performs really well when it comes to the way the threads blend together with long and short stitch. This type of silk has a slightly softer twist than cotton, which gives it a better “spread” when stitched. And then there’s the way the light plays off the silk. When shades of silk are blended with long and short stitch, they impart a real depth and a glow to the embroidery. And I don’t mean a garishly shiny glow. It’s more of a soft, deep, warm glow. Taking the softer twist and the play of light together, silk can even be significantly more forgiving when it comes to long and short stitch, too. So while a beginner might not spring for silk for shading on the very first venture, if you find you really love needlepainting, then don’t hesitate to try it with silk! At the same time, though, you have to consider what look you’re going for with the embroidery. There are times when cotton could be preferable. Think in terms of needlepainted animals, for example. Sometimes, cotton achieves a separation and distinction in fur and feathers in a way that might not work as well with silk. When it comes to teeny tiny details, cotton may work better for you, too, although keep in mind that silk embroidery threads are available in a wider variety of weights (thickness) compared to cotton, so you can usually find suitable silk threads – and a wider variety of them – for the tiny details, too. If you have a hankering to try shading with silk, don’t be held back by the notion that cotton is better for silk shading and that silk is somehow inferior to cotton for silk shading. Try it with silk and see for yourself! Have you used silk for shading? What’s your take? Any tips or encouragement for stitchers who want to try silk for shading, but are hesitant? If you’d like to chat about the topic of silk and cotton for shading, feel free to chime in below! Dear Mary, I use mostly cotton, for two reasons. 1-Silk is very expensive if you are on a budget and 2- It is hard to come by in my country South Africa. I find stranded cotton really gives a good shine and when I was lucky enough to get silk, it blended well with the cotton. I also use machine embroidery thread no 4o. The thread is slightly thinner than one strand of stranded cotton and comes in very handy where one needs tiny stitches. I prefer the thread made from rayon, but the ones of polyester is not too bad either. I know one can order threads on line, but besides the price, the shipping cost is astronomical. Wow, that rose is beautiful. Just stunning. I’m interested by the use of cotton for the leaves and silk for the flower. I guess if I had thought about it, I would have assumed that normally you would use either cotton or silk for a single piece. But the mixture certainly works. I have been working in silk recently, after a number of years using crewel wool. I love it. The depth of colour, the subtlety of shading, and the sheen. And just the indefinable air of luxury. Silk for me. At least at the moment. It was a very intentional choice to use silk for the flower and cotton for the leaves. I was experimenting and wanted to see the interplay between the two thread types. It worked out nicely, but is very difficult to truly capture in photographs. The matte finish of the cotton recedes and lets the glow of the silk be the star of the piece especially when it’s hit by a bit of light, especially sunlight. By the way, the backing fabric is silk which adds a nice soft glow as well. Before I stitched this rose I would normally use a single type of thread, but I expect this won’t be the last piece in which I mix silk and cotton! Hi all! On the subject of cotton vs. silk for needlepainting – I am a committed thread snob and try to use silk wherever I can. BUT there are occasions when cotton is a better choice, perhaps for the colour or finish of the image you’re stitching. The point I want to make is follow your instincts, and go with what looks best. The only thing I can say for certainty is that I personally will always pick silk thread because it suits me and my work. Another stitcher may say cotton for them. That’s the beauty of this craft. I would love to try silk. Have read a lot, but a bit confusing. Can u use silk for a whole project? Is silk just for shading?? Where can I get a good silk thread n a variety of colors. Hi, Pat – Needle in a Haystack (Alameda CA and online) carries the whole range of Au Ver a Soie silks. I use silk on whole projects – it’s not just for needle painting. The Tulip Festival project I’ve been writing about lately is all done in Soie d’Alger. Then there are differing types of silk. I’ve used both Madeira stranded silk, which behaves rather like stranded cotton, and Piper’s floss silk, which doesn’t. It even stretches a bit when used and I’ve found I needed to ‘pull it together’ on the back to take up the slack and produce a smooth result. It’s user preference as far as I’m concerned and, as with almost everything, there’s a trade-off to be made. Silk can look stunning, but it takes extra time, trouble and expense. 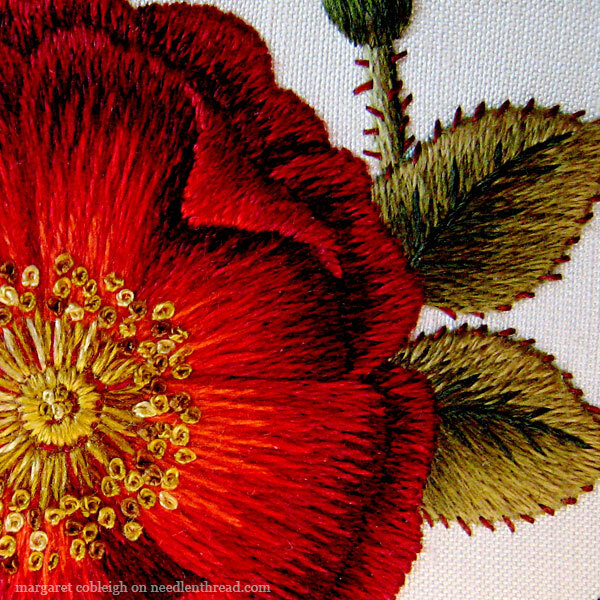 I’ve always used Soie d’Alger silk for needlepainting or silk shading, I find it is easy to work with and it gives such a lovely shine to the overall project. It is more expensive then Cotton thread but I find it gives a altogether different look to the embroidery which I prefer, but then I have only used the L&S stitch mostly on flowers and monograms not on animals so there would be a difference as you have pointed out. I’m sure that cotton thread when applied to the L&S stitch is lovely but it is just a preferenece I have towards silk especially Soie d’Alger which is my all time favourite thread. Thanks for your review on silk vs Cotton thread and for sharing your views with us I hope you have a great weekend. I love the idea of using silk. Question … Is there a chart comparing DMC colors to Soie d’Alger? I am not very good at picking colors and need guidance if switching to another type of thread, especially when ordering online. Hi, Alice – Hands Across the Sea has a nice conversion chart on their website, here: https://hands-across-the-sea-samplers.com/dmc-to-avas-thread-conversion/ They are always updating it, too, as they explore threads in the development of their samplers. But be advised that the conversion is not always “perfect.” But they’re usually pretty close!! with cotton (DMC) and some with silk (‘soie d’alger’). The jury is still out. There are three separate leaves – spring, summer, and fall. The spring leaf I prefer with cotton although there really does not seem to be much difference. The colours for the spring leaf are more vibrant. The ground fabric is Dupioni silk in a cream colour. I do find the cotton easier to work with – maybe because I have worked with more cotton than silk. Stay tuned. When I get them mounted I will send you some photographs. I have worked all the Thread painting projects have embroidered using cotton I have found Anchor threads have a different sheen in comparison to DMC . Trish Burr uses the combination of both. I also embroidered the “Flowers For Elizabeth” quilt using cotton there was a chart at the back of the book for using DMC instead of working on the wool I used a good white cotton fabric. I am on a limited budget which makes a whole project done in silks quite expensive and as I cannot get silk threads locally I have postage as well. I really appreciate these discussions, as well as the comments. I’ve been buying single skeins of various silks to try out, and I recently bought a lovely pink “art silk” from a site outside the US. Apparently “art silk” is actually viscose, or “artificial silk,” which I hadn’t realized. It’s very slippery and difficult to work. Of the four real silks I’ve tried, I prefer soie d’alger best, but I can certainly imagine choosing other brands, or cotton, depending on the project, ground cloth, stitches, &c.
Thank you Mary for this timely discussion. I have started a sampler and thought about doing it in rayon artificial silks. Not wild about how it is looking, and the fraying is well ANNOYING. Having read diligently your recent articles I have decided the project is not suited for this type of thread. Very early stages and I can frog without pain. Thank you Mary. As I am in the process of building up my “courage” to do a bit of shading, I am ready to go for it after reading your morning post. Until recently, never gave a thought to embroidering with silk. I have a stash of cotton floss, and I thought of silk thread as being extravagant. After reading your advice in recent years and perusing several of the books you referred to, my mind is changing. Especially after seeing the glorious, glowing red rose in the blog from yesterday, I am going to do my next piece in silk..at least partially. The leaves are beautiful, too. I like the idea of using silk for the centerpiece(s) of a piece of work. BTW, look forward to seeing the rose piece when it is finished. To me, your work is so beautiful and such perfection, it is museum quality. Next Next post: Tulip Festival Part IV – The Finish!